Dorian Burleson graduated in May with a bachelors in environmental and occupational health. Photo courtesy of Dorian Burleson. When we come into this world, we don’t get to choose our environment. Circumstance often finds us at our weakest, not our strongest. With a track record of beating the odds, whether posed by doctors, addiction or society, Dorian Burleson’s story is full of challenges that few can grasp and fewer can overcome. Burleson was born in the city of Inglewood. His premature birth led doctors to believe that he wouldn’t survive very long. He weighed only 4 pounds, and many of his organs were underdeveloped. Doctors diagnosed him with hyaline membrane disease, which reduces lung function, and jaundice that required regular blood transfusions. He recalls conversations with his mother, who told him that doctors were surprised he had survived. Against the odds, he outgrew these conditions, developing into a healthy young man with a passion for sports. In the years to follow, Burleson found his avocation: football. After a brief two years in Washington high school football in Los Angeles, his family moved to Houston and he became a running back for B.F. Terry high school, averaging 3.8 yards a carry. With an undying love for the game, he flourished. He soon won a scholarship to play at the University of Houston. However, the loss of a loved one pulled the family back to Los Angeles. This led Burleson to lose focus in school causing him to drop out a few years into his degree. After returning to Los Angeles, Burleson worked menial jobs, but eventually fell deeper into the street life. Before long, this lifestyle created a vicious cycle of incarceration and homelessness in the skid row districts of Los Angeles and San Diego. Burleson said he began rationalizing his addiction. However, after a second overdose, he knew he had to change or pay the ultimate price. Like any prodigal son, Burleson went to the only place he knew for help: his parents. They took him in and admitted him to Warm Springs Rehabilitation Center near Castaic Lake, where he embarked on a journey of personal responsibility and action. Burleson said that what pushed him toward his faith was an experience he had in rehab. He and his bunkmate woke up to what they perceived to be a divine presence in the room, and Burleson believe it was the sign from God he had been looking for since entering the program. “From that moment on, I knew my life would never be the same because this is not the type of situation one could easily forget or ignore, and over the years my faith has grown which has driven my outlook on life and work ethic,” Burleson said. After four successful months in rehab, Burleson was clean and ready to move forward with his life. Through a personal connection, he got a job with Kellogg, Brown and Root LLC, a construction and logistics company that works with U.S. military in war zones. The company stationed him in Kandahar, Afghanistan, as a carpenter in the midst of war. The conditions were, at best, challenging. Temperatures fluctuated from 120 degrees during the day to 20 degrees at night. His schedule required him to work 12-hour shifts, seven days a week, with nights spent in military-grade tents. In this brutal work climate, Burleson also suffered a debilitating injury. Burleson was diagnosed with transverse myelitis and a seizure disorder, a condition that causes inflammation in the spine, which confined him to a wheelchair, unable to walk, for 18 months. Again, doctors were doubtful of any type of recovery. Burleson struggled, physically and mentally. The limited exercise caused him to gain weight rapidly, reaching 315 pounds. After overcoming an addiction, the temptation to go back never felt stronger. “Many people don’t overcome an addiction to heroin and meth. I was blessed to beat the odds,” said Burleson. “But after this injury, it was extremely hard not to go back to using. However, I knew that if I went back to that lifestyle, I would surely die. Burleson, again, chose to trust his faith and give his all to physical therapy. Burleson made an almost complete recovery. Through this process, Burleson knew that if he took the right steps and maintained consistency, anything could be achieved. At age 40, he started a new journey: higher education. It had been some time since his last attempt at college, but he was determined. He enrolled himself in Antelope Valley Community College in Lancaster. In two years, Burleson left community college with four associate degrees and a wife, Heather LeBlanc, a nurse whom he met at college. The couple married on August 6, 2011. In 2014, Burleson transferred to California State University, Northridge to study environmental and occupational health, with a minor in biology. After everything Burleson had faced, he often felt like an outsider in his classes due to difference in background and age. 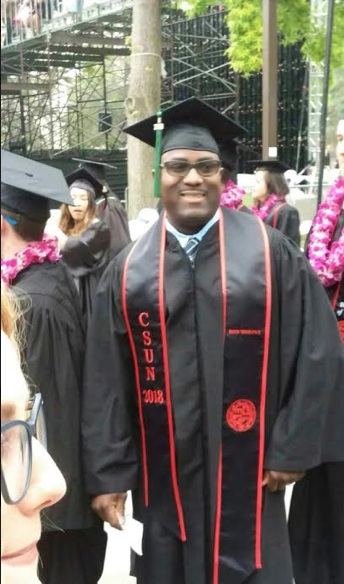 Burleson graduated from CSUN in May with a 3.87 overall GPA. 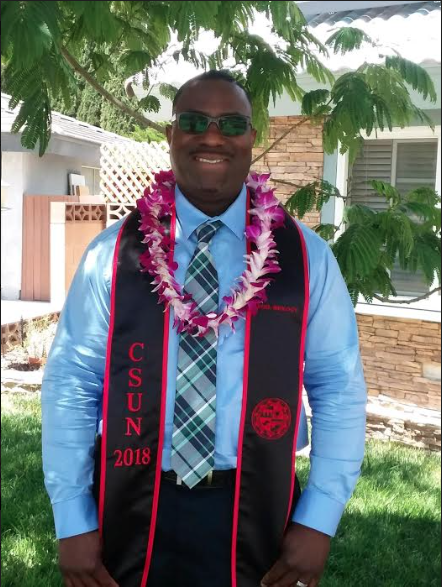 Now a homeowner in Lancaster, Burleson plans to pursue a master’s degree in environmental and occupational health at CSUN and establish himself in the field. From the beginning, Burleson seemed to be dealt the wrong hand. His journey shows that through dedication and hard work, the hardest of obstacles can be overcome.